Just about two years ago, I had the great pleasure of being introduced to Mr. Don Langrehr. He was one of the kindest, happiest, chattiest men I had ever met. He sat and spoke with my husband about everything from his life on the farm, military career, and years as a volunteer firefighter to the wonderful woman, Joan, whom he was so happy to have called his wife for many years, until her passing not long before we were introduced. 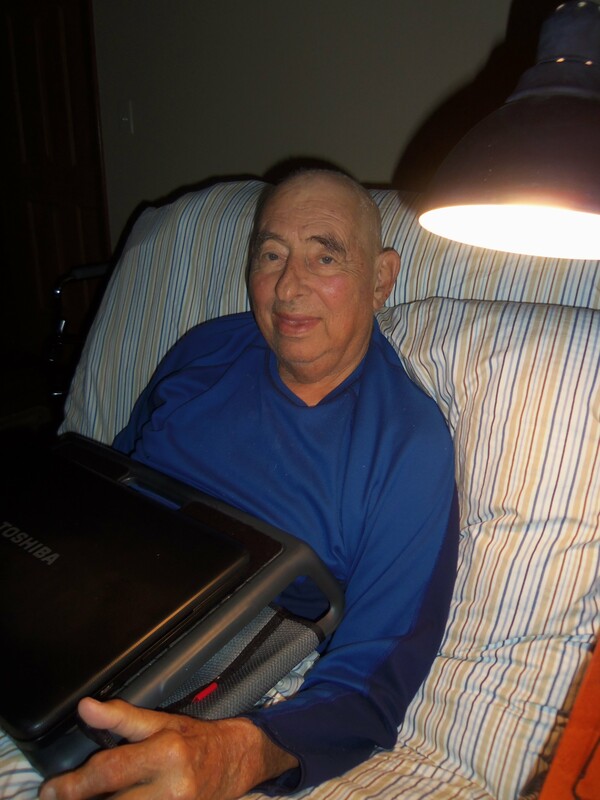 By the time we met Don, he was 81 years old and had been struggling for a while with Inclusion Body Myositis (IBM). He spent a great deal of time moving about by use of his scooter and had lost a great deal of the use of his hands. None of this got him down though…at least not on the outside. He loved his life on Rumsey Island and even signed off often as “The Bard of the Rumsey Canal”. He loved to scooter around the neighborhood to his favorite restaurant and really enjoyed having visitors who would stop to visit on a regular basis. His favorite past time of recent years was sitting on his patio and taking in all that nature had to offer. He was a lover of birds and history and life itself. He learned of my work with The Zone Magazine and, through my sister, I learned of his interest in writing for The Zone. He had so many stories to share and such a wonderful way of painting a picture with words. And so, in August of 2011, Don became the regular blogger for “Thoughts for Thursday” at The Zone, as well as a contributing writer for our monthly e-magazine. Almost every Thursday, he shared everything with us from his life as a child to the history behind most everything. I learned so much through Don’s postings and stories and enjoyed reading them tremendously, as did many of our readers. Late last year, Don learned that he was fighting a new battle…one with cancer. Even then, he didn’t seem to let it get him down. He continued to have a positive attitude and a smile. He looked at it as a new challenge and made the best of the hand he was dealt. It is with a very heavy heart that I share with you that we received word that Don has lost his battle with cancer and has passed on. He will be greatly missed and we can only hope, where ever he may be, that he is scooter free and soaring with the eagles. I know for certain that Joan will be at his side and that he is now smiling down at all of us, happy to know the secret of what’s to come and cheering every one of us on in our own journeys. Rest in Peace Don Langrehr, you were a son, brother, husband, father and friend but you will always be “The Bard of the Rumsey Canal” to this girl. Don’s last article for The Zone Magazine can be found in the upcoming April issue and, if you missed his blogs from the past, we encourage you to scroll back through “Thoughts for Thursday” and enjoy his many entertaining posts, he’d love to know that his stories continue to be read and shared. This entry was posted in Thoughts for Thursday and tagged Don Langrehr, Family, Harford County, Hereford Zone, History, Home, Rumsey Island, The Zone Magazine, Thoughts for Thursday. Bookmark the permalink.